This unique event was initially based on Ravens Crest/Ravens Crescent exercises which ran from 2004-2007 in Fort Lewis, Washington. When the funding for the program ended in 2008, some of the designers of the program started Ravens Challenge as a more flexible, tailored program that maintained the focus on EOD/CIED at all levels, and delivered it in the US in 2009 for DHS Region 5, which integrated US, Estonian, Canadian, military and law enforcement EOD and tactical units. 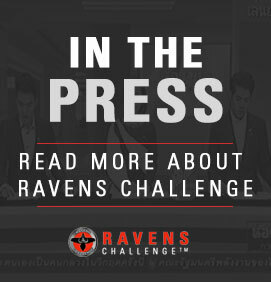 After several years of developing the program, the first global Ravens Challenge® took place in 2013 as a one-week program in Hua Hinn, Thailand, hosted by the Royal Thai Police Unit 191 EOD and funded solely by exhibitors and sponsors. Since 2013, the Ravens Challenge® ASEAN has represented the global EOD community and is held annually in Thailand. Ravens Challenge® ASEAN expanded to a two-week program in 2017 with the first week in Bangkok providing Commander workshops/classes and a Technology Day sponsored by the Defense Technology Institute (DTI). The second week remains in Hua Hinn for the CIED, CWMD, and Counter Terrorism training lanes. The need for interoperability and capability gap improvements within regional frameworks is ever more critical with the rising tide of instability that fosters terrorism and insurgency. Ravens Challenge® focuses on helping to identify those gaps and begins the regional partnerships to improve public safety and national/regional security. This commitment to regional safety is at the heart of Ravens Challenge®. Ravens Challenge® is available as a local event in other countries. Ravens Challenge® is a registered trademark owned by Raven Group International, LLC.